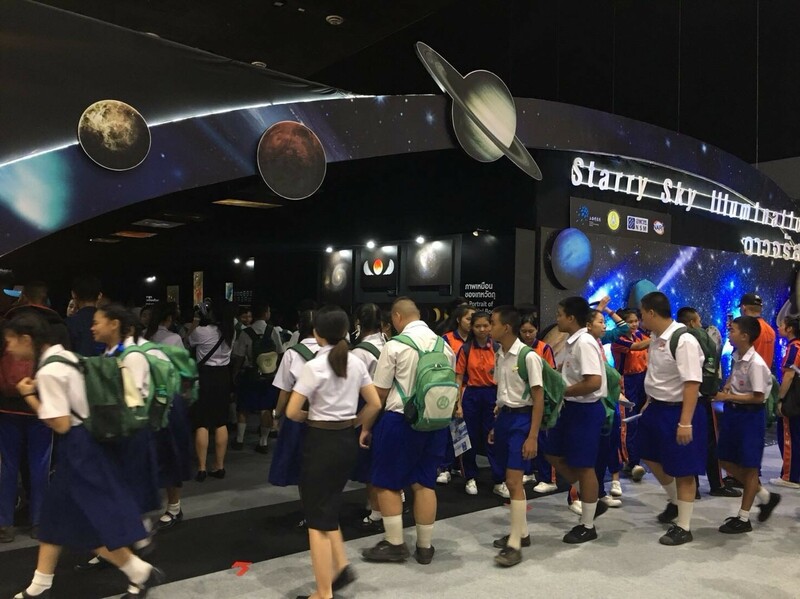 On June 4, 2018, "Starry Sky Illumination", an original exhibition created by Shanghai Science and Technology Museum, began its international tour with part of the captivating exhibits appearing on the 2018 National Science and Technology Fair of Thailand. As one of the brainchildren of the first international seminar on the development of popular science venues under the "Belt and Road" Initiative, the "Starry Sky Illumination" astronomical exhibition will be on display in Thailand National Science and Technology Museum for three months, starting from September 1, 2018, based on the agreement signed between Shanghai Science and Technology Museum and Thailand National Science and Technology Museum. Visitors can appreciate at close range some of the most marvelous astronomical photographs shot by photographers from across the world, and experience the magnificence of the starry sky created by a SUPER MEGASTAR-II which can project 22 million real star points. Shanghai Science and Technology Museum will also license the exhibition copyright to the Musée des Confluences of Lyon, France, and the exhibition will get underway in France next year.